The Gorgon’s Tarot is a rather unique deck. Like The Motherpeace and Daughters of the Moon decks, The Gorgon’s Tarot is round. The overall style of the deck is appealing to the eye. The images are depicted on black backgrounds with the images done in white. With the sole exceptions of the extra card, “The Blind Gorgon,” and The Devil card, The Gorgon’s Tarot is a strictly black and white deck. The Blind Gorgon is an extra card and it, plus The Devil card contain a splash of red. 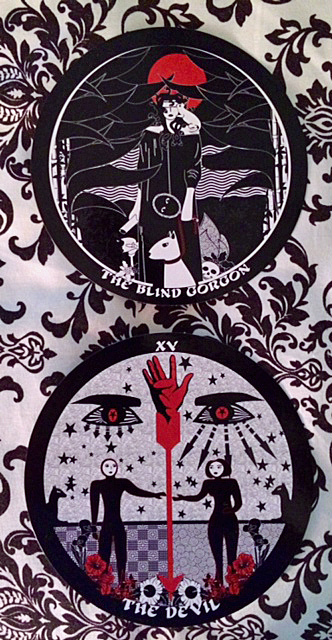 The Blind Gorgon & Devil cards from “The Gorgon’s Tarot” copyright Dolores Fitchie, 2014. The overall artistic style, graphic black and white images with mostly female characters and several kinds of animals; including leopards, ferrets, and cats, makes me think of art nouveau. What I particularly enjoy about The Gorgon’s Tarot is the manner in which patterns are worked into the images. Patterns are worked into the clothing of characters, background elements, suit symbols, and even some animals appear with patterns on their bodies. The use of patterns in The Gorgon’s Tarot make me think of Zentangles, a method of doodling that has become increasingly popular over the past couple of years. The patterns add texture to the images in The Gorgon’s Tarot, and when used as part of the background elements they also add a sense of depth to the images. The cards measure 5 ¾” across. When stacked, the deck measures nearly 1 ½” tall. I don’t have particularly small hands, but I am unable to rifle-shuffle these cards. They are well laminated so I use my deck on a table and the cards are able to slide across the surface. I mix them face down on the table, then reassemble my deck for the reading. 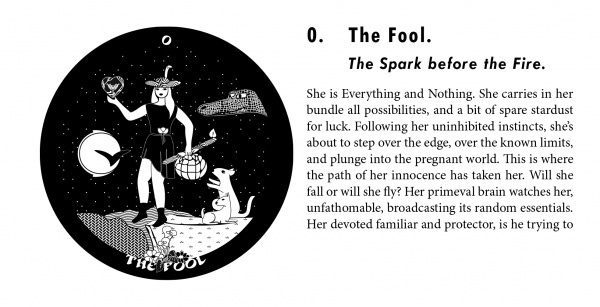 The Fool page from The Gorgon’s Tarot guidebook. wide. The book is rendered in landscape orientation and contains no page numbers, but according to the table of contents the book has 168 pages. All cards are reproduced in miniature at 2 ¼” in diameter. Card interpretations are typical of the Rider-Waite tradition, but I do suggest you read the author’s own description of her cards. She has a keen sense of humor that comes through not only in her discussion of her cards, but it is also apparent in the imagery as a whole. Interpretations are very short so it will not take you long at all to read the entire guidebook. Card interpretations include both upright and reversed meanings. Spreads are not included. I enjoy using this deck. I find it works well for pretty much any type of question. I also enjoy reading the author/artist’s own take on her cards, which read as tiny short stories that often give the reader food for thought. Example of a short reading. 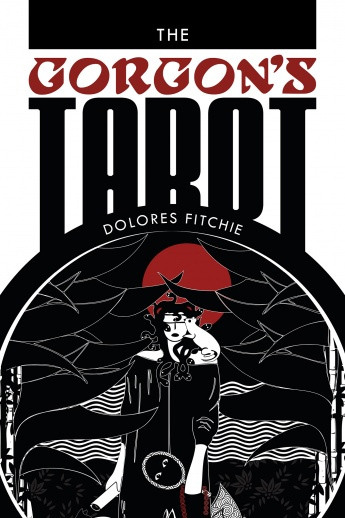 3-card reading with “The Gorgon’s Tarot,” copyright Dolores Fitchie, 2014. I did a 3-card draw of Past/Present/Future regarding today’s big headline hear in Texas about an Ebola patient in Dallas and how others he had come into contact with may be also infected. My query revolved around the general welfare of the people of Texas, the state in which I reside. 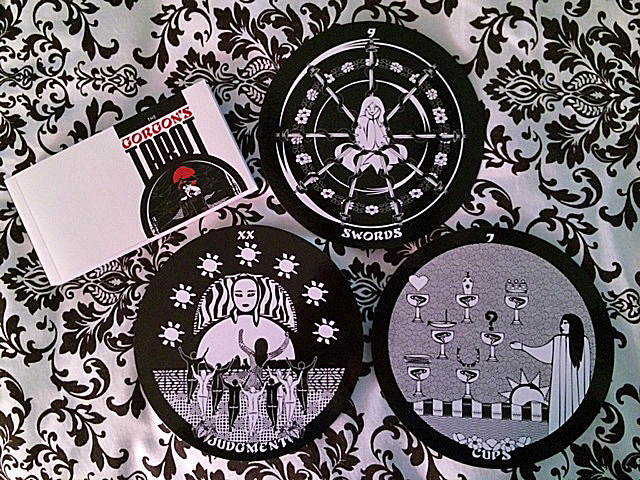 I received the 9 of Swords, Judgment, and the 7 of Cups. … she is unable to heed the wisdom of the snakes who try to tell her that our fear is so often much worse than any real threat, the bark worse than the bite. She dwells in a solipsistic bubble of terror and grief. She needs to find a way to pierce through it, and she’s not lacking the tools to achieve this. After all, swords can cut both ways. The 9 of Swords clearly speaks to the fear that Ebola may become a real outbreak here in Texas and this card is picking up on my concern for my daughter as well as the people of Dallas. Judgment in the Present position is all about preparing for our next stage in spiritual evolution. Things have come to a close and new developments are on the horizon. I see this card as a shift in perspective due to some form of illumination or perhaps a spiritual awakening. It could indicate that new realizations about Ebola and how to combat it will result from the medical profession’s work with this patient in Dallas. The 7 of Cups in the Future position represents the need to narrow down choices and focus better on alternatives offered. Given the current situation, I feel this reflects the media and all of the conflicting information that is now being announced to the public. On the one hand we’re told Ebola is not communicable except via bodily fluids, then in another newscast they tell us you can catch it via bodily contact from the perspiration of the infected individual. All of these cups represent people wondering who do we believe? Or do we simply believe what we wish to believe and go on about our lives? Overall, the cards tell me there is tremendous fear surrounding the entire situation that can be mitigated once people become better informed about how Ebola is transmitted. The 7 of Cups I take to be a warning to not listen to everything we hear and take it at face value. The public needs to evaluate the sources of their information as some are not as thorough or accurate as others. By remaining informed we can combat the disease and take the proper measures to protect ourselves. 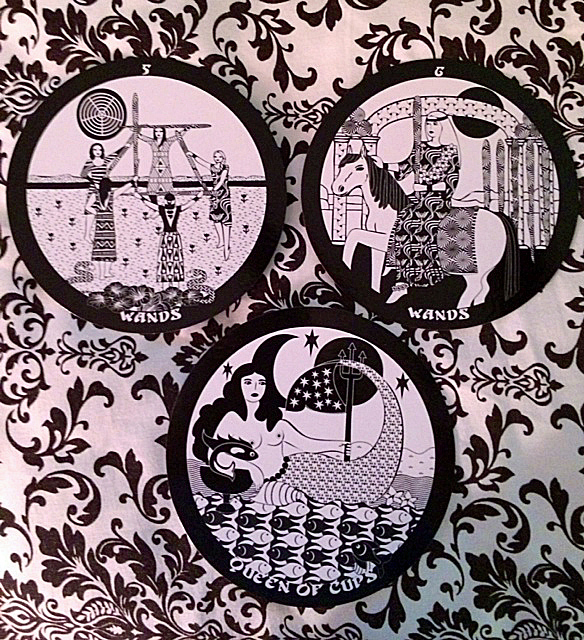 5 & 6 of Wands, Queen of Cups from “The Gorgon’s Tarot,” copyright Dolores Fitchie, 2014.
know if it’s because they are black and white so the absence of color may be a favor or if it is the varied patterns that are used on the cards. Perhaps it is those patterns that speak so much to my inner knowing, but I find that I don’t use the book at all. I examine the images and I ascertain how they make me feel and what they make me think. Then I factor that into my own interpretation of the cards and I find that method is working very well for me when I use The Gorgon’s Tarot. Suits are the traditional Wands, Swords, Cups and Pentacles. The major arcana is also traditionally named with Justice at arcana 8 and Strength at Arcana 11. Court cards are the traditional Page, Knight, Queen and King. As a result, I recommend The Gorgon’s Tarot to beginners, especially if they want to work with a deck that is fairly unique. Next Free Tarot Reading for the Week of October 10th.